It’s Christmastime in the burbs. Here’s what I’ve been up to lately in preparation for this most momentous of holidays. This year, I drew my dad’s name in our family present swap and he drew mine. He asked for jean shorts. He wants jean shorts for Christmas. I had a lot of fun searching for “Men’s jean shorts” on the internet. Surprisingly, many were available. In a twist of fate, my dad drew my name in our family present swap. I asked him for a deluxe toilet plunger. I asked him for a deluxe toilet plunger. It’ll look fantastic in my powder room in its sleek black case vs. the old plunger we have now that resides on paper towels after it’s used. 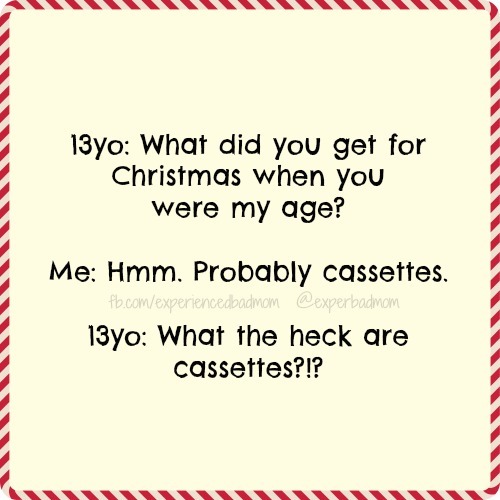 My teen son asked me an innocent question about Christmas past. And, a part of me died inside when I heard his reaction to my answer. My daughter, 10, was helping me look for our cat. So we looked under my bed. You know, where I’d hidden all the Christmas presents. I whipped her little body away from under the bed so fast it made her spin like Gracie Gold on crack. I politely explained why. Then she spent the next four days trying to look under the bed. Until I announced proudly that I had moved the presents out from under the bed. I’m not as smart as I thought. The resents are currently scattered willy nilly. Say a prayer I remember where! With all your free time this month, I just know that you are looking for good reading material. May I suggest one of my post popular posts? It’s on what it’s really like to have a baby in December and it’s published as a reprint this month in Ann Arbor Family Magazine. I’ve also got an original article in Neapolitan Family magazine on tips for making a December birthday party special. No, one of the tips is NOT smacking anyone who says, “Oh, it must be awful having a December birthday.” Although maybe that WOULD make all the moms of December babies feel better. 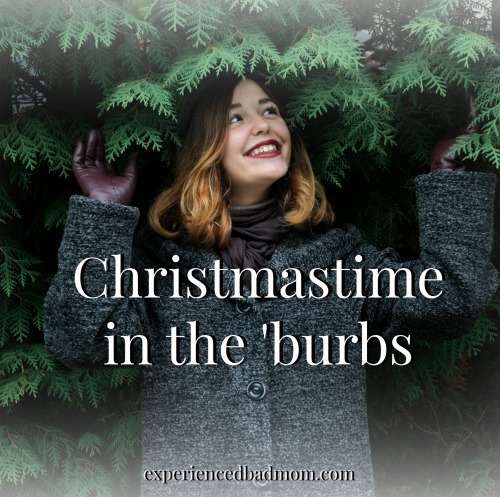 That’s it from my Christmastime in the burbs. How are the holiday preparations going in your neighborhood? Oh, Katy – Jean shorts? Seriously? Bless him. How wonderful that you were able to come up with multiple options at this time of year. And congrats on your publications – that’s brilliant. 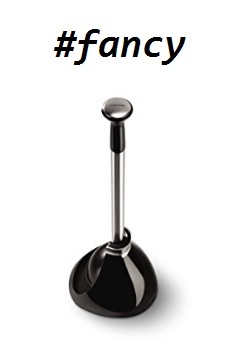 And may I say, that’s one fancy plunger! As for me, well you won’t believe it, but we’re buried under a foot of snow. Yes, here on Canada’s wet coast – unbelievable amount of snow and not even winter yet! I can’t believe you are buried under snow! Ah, well, as long as you don’t have to drive in it you should be able to enjoy it’s sparkling beauty. What is the oddest thing Frankie ever asked for for Christmas? Hope it’s a chapter in the book. Such a great question about Frqnkie. Hmmm. You know, I have to say that she’s never really asked for anything. Nothing. Zip. I think it’s because she’s the world’s greatest shopper and always just goes out and gets what she wants. However, I can report that I gave her an odd gift one year. Yes – darling daughter that I am, I gave her … a rat trap. Yup. Special, eh? We were in Hawaii and the house we were renting had rats. They’d gnaw on the papaya in the fruit bowl that sat on the counter … How’s that for festive cheer? Katy – Hilarious…and as always, so true….the old looking for the cat trick…my 11 year old did the same thing…what’s all that wrapping paper for she innocently asked…hmmm…Merry Christmas is coming fast…I love it all! Aw, thanks, Jeanne! It makes me feel so good to have entertained you. Merry Christmas to you and yours! You know you’re an adult when things like new plungers and sponges and stuff are actually exciting. I’m really looking forward to a water pitcher that I asked for this year. Being a grown-up is stupid. Being a grown-up is stupid–LOL! So true. One year I got new windshield wiper blades and I was pleased. Jean shorts, fancy! I told my children that if they go looking for my hiding spot, there will be NO presents. I didn’t blink and had my mean face on when I said it. So far it has worked. I cannot write a comment as I am currently too overwhelmed by picturing my dad in jean shorts. I’ll be back another time if I recover!